The Values of Precision edited by M. Norton Wise is a collection of essays from the Princeton Workshop in the History of Science held in the early 1990s. 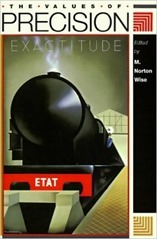 The essays cover the period from the mid-18th century to the early 20th century. The early action is in France and moves to Germany, England and the US as time progresses. The topics vary widely, starting with population censuses, then moving on to measurement standards both linear and electrical, calculating methods and error analysis. The first article is about the measurement of population, mainly in pre-revolutionary France. This was spurred by two motivations: firstly, monarchs were increasingly seeing the number of their subjects as a measure of their power and secondly, there was a concern that France was experiencing depopulation. In the 17th century the systematic recording of births, deaths and marriages was mandated by royal direction. In the period after this populations were either estimated from a count of “hearths” or from the number of births. The idea being that you could take either of these indirect measures and multiple them by some factor to get a true measure of population. The second article is by Ken Alder, he of “The Measure of All Things” and is another trip to revolutionary France and their efforts to introduce a metric system of measurement. The revolutionary attempt failed but the system of standards they created prevailed in the middle of the 19th century but not without some effort. Alder highlights the resistance of France to metrification, and also how the revolution bred a will to introduce a rational system based on natural measurements rather than a physical object created by man. He also discusses some of the benefits of the pre-metric system: local control, the ability for workers to take a cut without varying price, connection to effort expended/quality. This last because land was measured in terms of the amount of grain used to seed it or the area one person could harvest in a day – this varies with the quality of the land. Jan Golinski writes on Lavoisier (again from France at the turn of the Revolution) regarding “exactness” and its almost political nature. Lavoisier made much of his exact measurements in the determination of the masses of what are now called hydrogen and oxygen in producing a known mass of water. This caused some controversy since other experimenters of the time saw his claims of exactness in measurement to be mis-used in supporting his theory for chemical reactions. There were reasons to be sceptical of some of his claims, he often cited weighed amounts to more significant figures than were justified by the precision of his measurements and there are signs his recorded measurements are a little too good to be true. These could be seen as the birthing pains of a new way of doing science which didn’t just apply to chemical measurements of the time, but also to surveying and the measurement of population. These days the inappropriateness quoting of more significant figures than are justified by the measurement is drummed into students at an early age. Next we move from France to Germany and a discussion of the method of least squares, and the authority of measurements by Kathryn M. Olesko. Characters such as Legrendre and Laplace had started to put the formal analysis of error and uncertainty in measurement on the map. This work was carried forward by Gauss with the method of least squares, essentially this says that the “true” value of a measurement is that which minimises the squared difference of all the measurements made of that value. It is an idea related to probability, and it is still deeply embedded in how we make measurements today and also how we compare measurement to theory. In common with events in France, the drive for better measurement came in Germany with a drive to standardise weights and measures for the purposes of trade. The action here takes place in the first half of the 19th century. The trek through the 19th century continues with Simon Schaffer’s essay on the work in England and Germany on electrical units with a particular view to establishing whether the speed of light and the speed of propagation of electromagnetic waves were the same. This involved the standardisation of units of electrical resistance. It was work that went on for some time. Interesting from a practicing scientists point of view was the need for the bench scientist and instrument makers to work closely together. The next chapter is a step away from the physical sciences with a look at life insurance and the actuarial profession in the first half of the 19th century. Theodore Porter describes the attitude of this industry to precision and calculation, noting that they fended off attempts to regulate the industry too tightly by arguing that there business could not be reduced to blind calculation. The skill, judgement and character of the actuary was important. The Image of Precision is about Helmholtz’s work on muscle physiology in around 1850, he used an apparatus which showed the extension of a muscle graphically following stimulation, and measured the speed of nerve impulses using similar methods. The graphical method was in some senses less precise than an alternative method but it was a more compelling explanatory tool and provided for better understanding of the phenomena under study. Next up is a discussion of the introduction of so-called “direct-reading” ammeters and voltmeters by Ayrton and Perry in around ~1870. This was an area of some dispute, with physicists claiming that determinations of volts and amps be made by reference to the basic units of length, time and mass. Ayrton and Perry were interested in training electrical engineers whose measurements would be made in environments not conducive to these physicist-preferred measurements. Not conducive in both a technical sense (stray magnetic fields, vibration and so forth) nor in the practical sense (an answer within 1 percent in 10 minutes was far superior to one within 0.5 percent in 2 hours). As we approach the end of the book we learn of Henry Rowland, and his diffraction gratings, made at John Hopkins university. Rowland had toured Europe, and on his return set to making high quality diffraction gratings to measure optical spectra. This is a challenging technical task, to be useful a diffraction grating needs many very closely spaced lines of the same profile. Rowland sent out his diffraction gratings for a nominal price, making no profit, but did not reveal the details of his methods. It took many years for his work to be better, and even longer yet for better diffraction gratings to be available generally. The collection finishes with the construction of mathematical tables, starting with a somewhat philosophical discussion of the limits of calculation but moving onto more pragmatic issues of the calculation and sharing tables. The need for these tables came original with the computationally intensive calculations for determining the longitude by the method of lunar distances. The 19th century saw the growth in mathematical analysis in a range of areas, spreading the need to make mathematical tables. Towards the end of the century machine calculation was used to help build these tables, and do the analysis they supported. Students of my generation will likely just about remember using tables of trigonometric and other functions, these days in my practical work they are entirely replaced by computer calculations done on demand. There is a lot in here which will speak to those with a training in science, physics in particular. The techniques discussed and the concerns of the day we will recognise in our own training. The essays hold a slight distance from practitioners in this arts but that brings the benefit of a different view. Core to which is the way in which precision in measurement is a social as well as technical affair. To propagate standards of measurement requires the community to build trust in the work of others, this does not happen automatically. I like this style of presentation, each essay has its own character and interest. The range covered is much larger than one might find in a book length biography, and there is a degree of urgency in the authors getting their key points across in the space allocated. In this book the various chapters do not overlap in their topics and cover a substantial period in time and space with the editor providing some short linking chapters to tie things together. All in all very well done.